Jefferson Park residents were pretty ticked off as they showed up in impressive numbers, Friday evening, January 7th, 2010, to protest another destruction of a single family home in its university area neighborhood. It is an ongoing saga. The Star published a piece entitled: In Jefferson Park, It’s About Greed, Not Student Tenants. 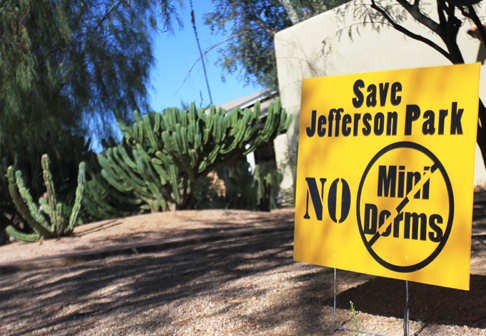 Neighborhoods would like to stop the development of mini dorms which is a reason for recent demolitions in Jefferson Park and Feldmans neighborhoods. In September, Feldmans lost one of last remaining examples of a classic stone craftsman bungalow. What is driving all of this, is the economic reality of students wanting to rent near to the University. Meeting these needs is profitable now and its done in a vacuum of broader planning and leadership in preservation. Meanwhile, the City of Tucson and the University of Arizona are losing significant pieces of a residential fabric that speaks of a waning asset; a diminishing reason for wanting to live around the University. Are we losing? Jefferson Park is the second attempt in two years at creating a design manual to activate a recent ordinance called the Neighborhood Protection Zone (NPZ). Developer’s see the City’s efforts as a fairy tale. The problem is that proposition 207 strips the ability of an Arizona jurisdiction to put teeth into any planning ordinances enacted after 2006. This is the context in which remedies are sought and have stumped City officials. Karen Uhlich, Jefferson Park’s Ward Representative said in her latest ward 3 newsletter; …”In recent weeks my office has received countless pleas for City intervention from areas zoned R1 where existing small homes are being demolished in preparation for the construction of mini-dorms. Residents clearly expect the City to ramp up our efforts to challenge this infill trend”… It’s difficult for people to see hope in ward 3’s response. They know that the issue is not new to Uhlich’s office. U of A neighborhoods need a much bigger look at planning and incentives on a scale not yet undertaken by the City of Tucson, moreover, the City, paralyzed by its own budget crisis and inability to focus on the problem has simply not taken this on, other than in ways we know have no teeth or significant incentive. Pressure put the fire under the feet of the Mayor and Council to heat up commercial development incentives downtown. That much and more can be done for university area neighborhoods as well.